I try to keep my blog rated PG. Then I come home to this. 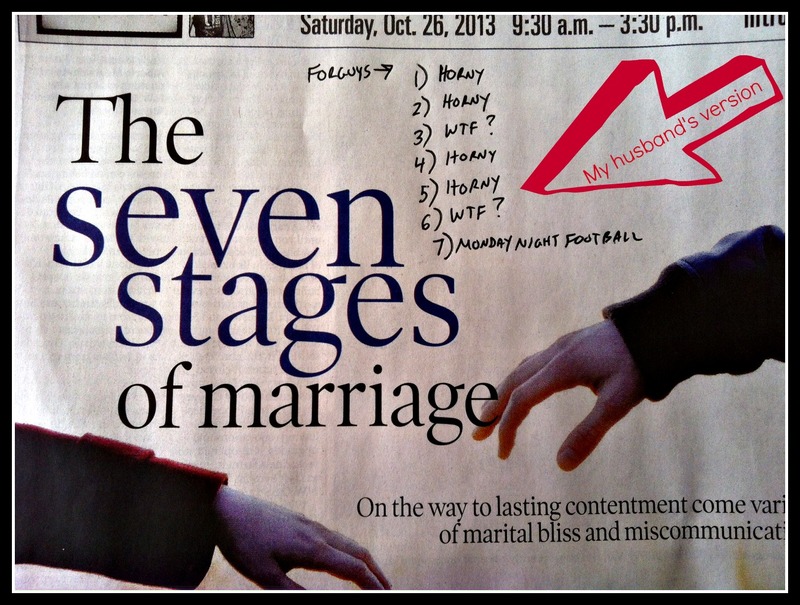 Yes, it’s my husband’s version of “The Seven Stages of Marriage,” scrawled on top of the original article from The Calgary Herald. Tonight I’m going with Monday Night Football. What are your 7 stages of marriage? Or, what are your 7 stages of raising kids? Omg, that is hysterical! I’m sure my husband would have written the same. As for my 7 stages of marriage, well I would probably agree with the horny being first (it’s not just for men), then kids, tired, more kids, less money, drive kids everywhere, kids move out, horny comes back. Hilarious, Catherine! I’m somewhere between your stage one and your stage five. Love this, Bill. Especially the “repeat” part. I feel that I get that. 1. Look at my kid! 4. Look at how much my kid has grown! 5. Look at all this homework. 7. Looking for my kid. Way better than The Calgary Herald version… that one was downright depressing…. Funny gets it every time! Obviously our husband’s are twins separated at birth. 1. Do you need to call your mom again tonight? 2. Do I need to see your corpulent sister at our front door, in our living room, cleaning my bathroom, again? She can bring dinner over again, though. 3. If there is no food in the refrigerator, what happened to our grocery budget this week? 4. Whose turn is it to kill our son this week? 6. How much do divorces cost? 7. Did you read that note with Ephesians 5:22-24 that I left for you on the refrigerator? How about the one on your pillow? The one I taped to your Slimfast can? I am going to carve it in the door of the refrigerator. I am at stage six. Oh, I should have guessed that’s what it was! Where’s the verse about husbands giving their wives foot rubs every night? If we’re going to quote scripture, let’s not just pick out what we like. I agree with you, David. Where should I pin my next note? Yeah, should have guessed that. I would never throw those verses in my spouse’s face. I believe the foot rub verse follows “Jesus wept”. I have to change my 7 stages because my wife says I did them wrong. Oh this is hilarious – I love it! My Seven Stages of Marriage? Hilarious. Thank your husband for confirming the universal male perspective for us! Lol….my hubby enjoyed your hubby’s version!